2015 KCA National Speciality Sweats, Tees, and Jackets! KCA’s National Specialty shirts and jackets are available for sale. Item # G800 is the T-shirt (Gildan dry blend) at $15.00 each. 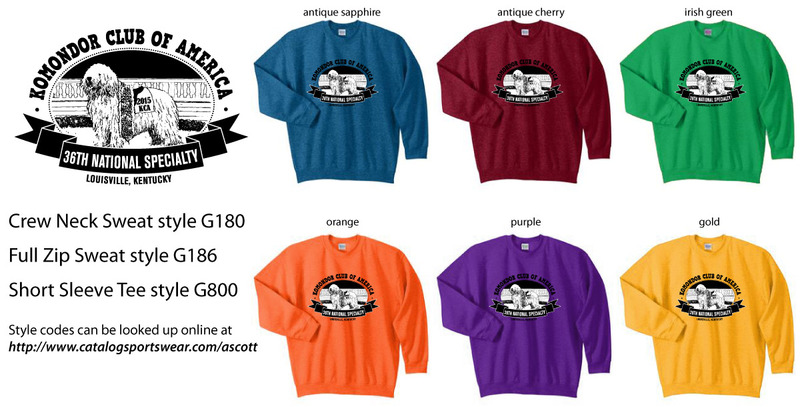 Item # G180 is the fleece crew (Gildan heavy blend) at $25.00 each. The full-zip hood jacket (Gildan heavy blend) is item #G186 at $35 each. Copyright © 1998 - 2019 Komondor Club of America. All Rights Reserved. Some material has been contributed by others and licensed. This information is for personal use only. Nothing on these pages may be reproduced without the written permission of the Komondor Club of America and the respective copyright owners.